bloggiebloggieblog: bad day turned magical.. I started tearing up in my stats class during the test review yesterday. I knew there was no way i'd pass the final the next day, especially since i had zero time to study. I averted my eyes from my teacher and rushed out the door, walked to the parking lot in the snow, got in my car and called my mom. Tears poured outta my sorry little eyeballs. Snot was running all over my face and my voice was plugged with my head cold. I pressed "2" and a quick "send"..dear ol mommys speed dial number. "b-b-b-u-t if i fail i won't get into my program and.. and.."
She asked if it would be better if i stayed and logan and missed the long awaited Michael Buble concert so i could study and pass. "NO THAT WILL BE WORSE!!!!" I glared at the cars around me looking at me wiping the snot and tears off my face. I tried to send the staring bystanders gamma rays of hate via my pathetic tear-stare. I got back to my apartment, only to find out that not only was i going to fail my first college class ever, but also that my ex, boy (a), had been double timin it the whole time a few months back. A certain 'homewrecker' (lets call her, trixie) was bragging to my best friend that she was the one who broke up "boy (a) and 'wifey' (me)" and that boy(a) left his beloved 'wifey' for his beloved 'trixie' and 'trixie' and boy(a) still have a running joke about wifey to this day. And yes, in case you were wondering, i was completely oblivious to the whole situation. oh ps NBD that i find out that boy (b) who has been currently on my mind has his mind currently on something else. right infront of me. that is blonde. and probably brunette. and probably a few red heads here and there because thats just what boy (b) likes to do. what else could go wrong!? what i ask you?! i arrived at the E center with a sad little heart and weepy eyes. cry cry cry. oh that sweet voice of his soothed my soul. and i was in the same room with him. he was singing TO ME. i've only been obsessed with him for about 3 years now. and then..he sang billy jean. and danced like MJ. my two favorite things in the world. together. all i needed was a reeses and i'd be slap happy. i soon forgot about statistics, trixie, boy(a) and boy(b). how could i dwell on my awful day with this beautiful hunk of jazz man singing to me!? I couldnt help but clapping like the crazed Wonder's fan on 'That Thing You Do'. i probably imagined it 5 or 6 whole times while he sang 'best of me' and gazed into my eyes through that big jumbotron. 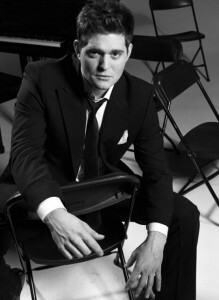 next time buble, next time. at the end of his dancing and wooing and all of the women in the crowd swooning and drooling at him...he sang the last song without his mic.. and 10,000 people were dead silent. ....and then Michael made an announcement that he wanted to marry me and he asked for my hand right then and there and everyone was super jealous and i blushed and it was magical. Trust me, I know it doesn't seem like it but you lucked out!